It was not the result of seeing this new book of wonderful photographs that Larry & Carolyn did a little jaunt to Indianapolis, but it could have been. Indianapolis is the capital of the State of Indiana, as it should be, just like the capital of Illinois should be named Illinoiston, the capital of Texas should be called Texasville and the capital of Wisconsin should be known as Wisconsinopolis. Back on track, with the time change, we were at White River State Park by 1pm and enjoyed really good parking rates: $3 for 3 hours, $6 for 6 hours, $12 for 12 hours. This is good pricing strategy. We were not the only ones opting to pay possibly more than $1/hour "just in case" we wandered past 4pm. That area, west of the Capital and central business district, is still pretty central, boasting not only the White River meandering along, but also, gateway to the Indiana State Museum and Eiteljorg Museum of American Indians and Western Art, as well as the canal which runs parallel to the river in Indianapolis, conceived in 1836 as part of the project to link the Wabash-n-Erie Canal to the Ohio River, it was never finished and is now a refreshingly clean stretch of water for paddleboats with beautiful walks, quiet memorials and residences alongside it. 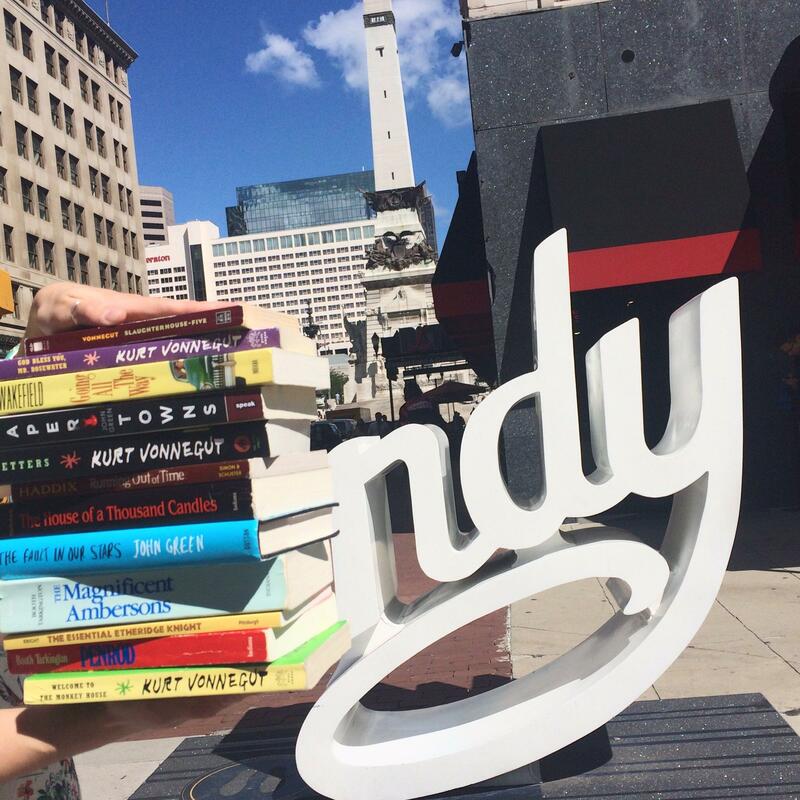 What can I say about Indianapolis, but that it is a very book-friendly, bike-friendly town. There were sculptures with books all over the city, sort of combining Tiny Libraries with three-dimensional art. I even saw people reading the titles in the sculpture near the Soldiers & Sailors Memorial in the heart of the city, looking to borrow reading material. You noticed that I did not mention the Indianapolis Museum of Art. It is not located downtown. It is not on the Northeastern edge of downtown, as the bartender (from New Orleans) at Revolucion believes. We would not even say that the museum is on the Northwestern edge. It is a good 5 miles from White River State Park which one could say is on the western edge of downtown (if we call the Capitol Building the Heart of Downtown), in a leafy area just off Dr Martin Luther King, Jr Street, which heads northwest out of Indianapolis proper, past the greater portion of a very large cemetery. The area is so leafy, in fact, that the large sign marking the corner of the institution's property at 38th Street. By the way, for all that the IMA has an address 801 West Washington Street, the access from MLK Street is blocked and it appears to us that the IMA is the only address on West Washington Street. Indianapolis is very walker-friendly (barring the aforementioned IMA), also, even while major interstate roads surround and bisect the town. We stayed in Fountain Square which really hops on First Friday (as it sometimes does at Dixon's Second Saturdays). We already mentioned the nouveau Mexican bar with food, Revolucion (sorry, don't have enough HTML savvy to put that accento on the o). We are told that the al fresco bar in back has a whole different vibe, but did not check it out. The fountain for which the square is named (there are actually two of them now) is not as large as in photographs, but quite interesting. The one coffee place closed, but I had read in the local newspaper that an upscale (really, is there any other kind?) chocolatier would be coming into the space and the "coffee bar will remain." It doesn't seem possible, but possibly, coffee is not the preferred drink in Indianapolis. I only just remembered there was a Starbucks on Monument Circle when I searched for "Starbucks in Indianapolis." They are not falling all over each other like they do in Chicago. There was a fairly expensive (read, "Starbucks pricing") independent place walking just over the highway on Virginia Avenue from Fountain Square towards downtown in the very trendy Fletcher neighborhood. Here, at Calvin Fletcher's Coffee Company, the price of everything is different. That is, a cup of decaffeinated coffee (small or large) is different from a cup of regular house brew (small or large) is different from the Ethiopian (seems to be another regular brew) is different from the daily special "Now Roasting." There's a lot of lounging around at low, mismatched tables and chairs and by the tip jar was a sign announcing which not-for-profit organization would receive all the tips for the day. I liked that I could not smell the coffee roasting, To me, when green coffee is being roasted, the place smells like there are tires burning in the room. I perhaps should not take it literally that there was coffee "now" roasting. It was nice. We sat by the front window, which had a miniature frontier home displayed and there were miniature rugs and other household objects and animals. It was a little dark and there were quite a few people there, so I did not walk around and see if there were local crafts to tempt my purse. We had already stopped by Wildwood Market, and purchased every non-perishable foodstuff made in Indiana for personal enjoyment as well as gift-giving. It was good to see such a place in Fountain Square -- local, owner-run, reflective both of the neighborhood's needs and the proprietors' vision. We kind of hope that sums up Books on First.